Looks like the third time isn’t the charm for British retailer Primark. After a Welsh woman discovered a “cry for help” stitched into the lining of a £10 dress she purchased, two additional shoppers have stepped forward with handmade messages of their own. 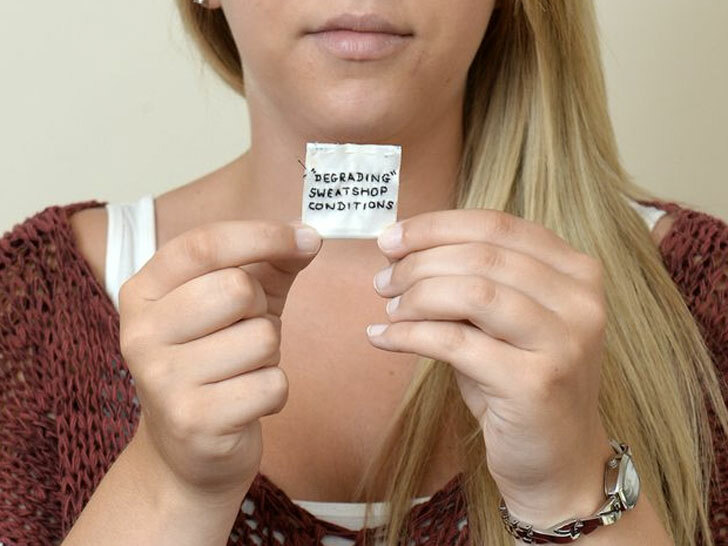 Rebecca Gallagher from Swansea was the first to report a label with the hand-embroidered message, “Forced to work exhausting hours,” on Wednesday. A few days later, 21-year-old Rebecca Jones, revealed a similar label—this time bearing the words “Degrading sweatshop conditions”—on a dress she purchased at the same Primark store. “I have no idea who made the label or how it go it there—but it does make you think,” Jones told the South Wales Evening Post on Friday. 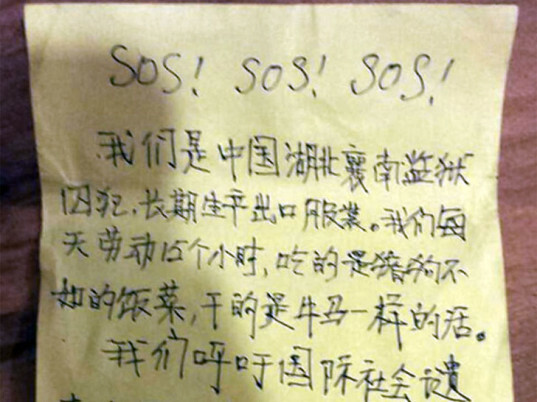 A third shopper, Karen Wisínska of County Fermanagh in Northern Ireland, claimed to find a note, alleging slave labor conditions in a Chinese prison, hidden inside a pair of trousers. Wisinska told BBC News that she bought the trousers in Primark’s Belfast store in June 2011 but had never worn them. It was just last week that she discovered the missive, which was wrapped around a jail identity card. The author of the note said inmates are forced to work 15-hour days “like oxen” making clothes. They were also fed “worse than pigs and dogs,” he said. The veracity of the labels and note are still unclear. Primark has described the matter as “very strange,” noting that both Gallagher and Jones’s dresses went on sale a year ago, while Wisínska’s trousers were last sold in Northern Ireland in October 2009. Primark’s ethics came under scrutiny after it admitted to sourcing clothing from Bangladesh’s Rana Plaza factory, which collapsed and killed 1,133 people in April 2013. The company subsequently became the first U.K. retailer to sign the legally binding Accord on Fire and Building Safety in Bangladesh. It also recently announced that it will pay out a further $10 million to the victims and families of the disaster after its initial round of $2 million in short-term support. Primark released another press release on Friday declaring that the Swansea labels are “more likely than not” to be hoaxes. Primark said it is still investigating the origin of the note from the North Ireland trousers, as well as any link it may have to the Swansea labels. Looks like the third time isn't the charm for British retailer Primark. After a Welsh woman discovered a "cry for help" stitched into the lining of a �10 dress she purchased, two additional shoppers have stepped forward with handmade messages of their own. Rebecca Gallagher from Swansea was the first to report a label with the hand-embroidered message, �Forced to work exhausting hours," on Wednesday. A few days later, 21-year-old Rebecca Jones, revealed a similar label�this time bearing the words "Degrading sweatshop conditions"�on a dress she purchased at the same Primark store. "I have no idea who made the label or how it go it there�but it does make you think," Jones told the South Wales Evening Post on Friday.